We operate three facilities in close proximity to each other. TPI, MTI, and TPI plant two. TPI is our powder metal manufacturing facility. This facility occupies 24,000 sq. ft. We currently operate with 15 presses (ranging from 5 to 750 ton capacity) and three continuous belt furnaces. Our staff at TPI custom designs tooling, fixtures, gages and parts tailored to our customer’s specifications. Working closely with our customers in the early stages of design enables the powder metal (P/M) part to be designed in the context of the entire assembly, rather than as an isolated part. A lower-cost powder metal (P/M) part can often be achieved through small changes in an assembly. MTI is our Precision Machining Facility specializing in tool & die fabrication, gage construction, component prototyping, machine components, weldements and fabrications, and general machining services. This facility supports both our powder metal and production machining sites with the tooling, fixtures and gages necessary to support production. These same services are available to all our customers to complement our production capabilities. This part was initially manufactured as a three-piece wrought iron assembly. A P/M competitor then converted it to a P/M part with a steel pin pressed through the ID. 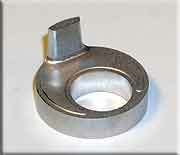 This part was converted from a casting to P/M by TPI working closely with the customers engineering department. This part points out the importance of early design consultation with the TPI engineering staff. Taking the part design from a round casting, as shown in the background, to the finished P/M part in the foreground has generated substantial cost savings for the customer.